Ships from and sold by Kartice AU. 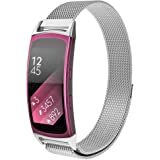 Elobeth for Samsung Gear Fit 2 Pro/Gear Fit 2 Watch Band, Milanese Magnetic Loop Stainless Steel Watch Strap + Connector Metal Adapter for Samsung Gear Fit 2 Pro/Gear Fit2 Band Silver 7.1"-10.2"
5.0 out of 5 starsPractical and Attractive! I have placed this watch band on my Samsung Fit 2 Pro and it’s a perfect fit. This Milanese/magnetized style watch band is comfortable to wear, easy to adjust and lightweight. I love the plum colour and friends have remarked how classy it looks. I feel this has been a very good buy. It is a very premium feeling wrist band. My old base model one broke so needed to get this and am happy with my choice. It has a strong magnet so not too much issue of it falling off. Although I imagine if you do some very vigorous shaking of your hand then it might come a bit loose. It is quite comfortable don't really feel it all that much and provides more flexibility than the old one. It fits well enough, not a 100% fit a tiny bit off center however nothing you would notice unless you felt it with your finger. The band was very pretty, the design was nice and didn’t look likely to randomly fall off. 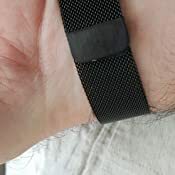 However the clips wouldn’t fit into the gearfit slots without some pressure, even then one side (shown in the photo) wouldn’t click into place and I won’t be able to ever wear it as a result. It might be a one off issue as it seems to be a very small defect causing it and when I emailed the supplier they were polite and very quickly offered a replacement or refund. The strap is good and does the job but occasionally it tends to stick onto something metallic which can get annoying. 5.0 out of 5 starsGood quality, fits my Samsung Fit2 very well. 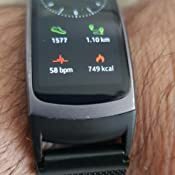 Was a little concerned as a couple of reviews noted that the band didn't fit their watch well. Fortunately, I should not have worried - the band clipped on very snugly. You can of course see a fine seam, but it's no more or less than the original band. The metal band is a little heavier than the original silicon band, but not by much so the difference is not really noticeable. 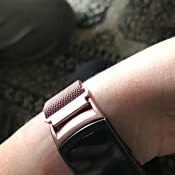 The material is a very fine woven metal chain mail mesh that is comfortable and suits the watch very well. I have fairly hairy arms, and the mesh is so fine my hair tends not to get caught in the band as happens to me with some metal bands. The magnet is quite strong, and doesn't appear to slip. 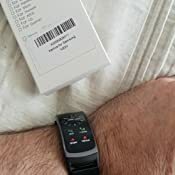 In fact when I take the watch off now I just unclip the band and loosen it as far as it goes - but don't completely pull the magnetic clip out. Then when putting the watch back on, I just slip my hand through the band and tighten it up. Very easy to do and much faster than putting on the old band. Any issues? Well none so far. 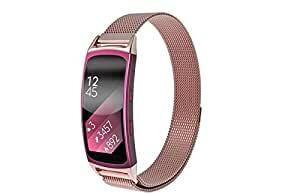 The band is quite long, so if you have small wrists (ie currently use the small Samsung band) you may have issues as it cannot be shortened as far as I can see. 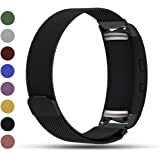 The magnetic clip comes with protective plastic films on both sides - if you leave them on it may protect the band from scratching for a while, but it would impact on how well the clip sticks to the band (I just peeled them off). I don't know how long the band will stay looking as good as it is now - some black metal bands scratch and lose the coating fairly easily, so we'll see how this one goes. I assume that in time it will happen, but how quickly will depend on how careful I am with the band and how thick a coating the metal has. So basically, very happy with this band.